Boy is this week going by FAST! of mistakes~ LOL yes The Queen does make mistakes too! YOU MUST use a Wobble on your CARD! down and of course it WOBBLES so really it's PERFECT!! 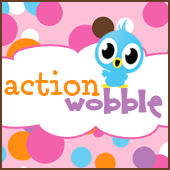 (Now if you don't have any Wobbles yet, don't worry! . Big congrats Jeana...your card rocks! Super fun challenge! I wasn't going to enter until I realized my ribbon was poorly placed and stops my bus from the full wobble!